During this trip to São Paulo, we stayed in Vila Madalena because of its street arts profile and the famous Beco do Batman. Vila Madelena feels like Williamsburg, cutely packaged local artisan boutiques, architects and graphic designers, amazing restaurants and bars at every turn. One morning we ventured out to the Liberdade neighborhood, home to Brazil’s 120-year old Japanese population. Our print tourist map outlines Liberdade like it is the eastern coast of SP, like there is nowhere else to go on the other side of Liberdade. Our time in Liberdade was overcast, but the neighborhood was more gritty than VM. Interspersed with street market vendors were homeless and and tired people, knock-off merchandise on tarps for easy transport. Our Paulistano friend explained that cost of living in the center of town was too expensive and that people moved farther and farther to the outskirts. There were not many tourist attractions past Liberdade, which explained why our map abruptly ended there. This mural rose above us as we crossed a highway overpass and it was perfectly timed and placed. We stood on this overpass to take pictures of the mural, talk about education access and notice that the city continued far east of the Liberdade neighborhood. 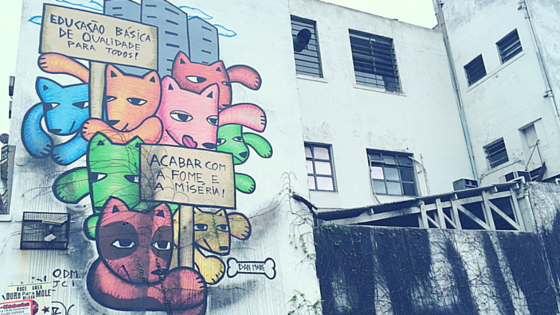 Of the many murals that we saw that week, this was the most overtly political (not counting the anti-Dilma graffitis). Basic quality education for all will put an end to hunger and poverty. Brazil has one of the largest education achievement and access gaps in the world, based on their PISA results. Fundação Lemann has launched an Excelência com Equidade program to address the disparities in education for lower socio-economic communities. I’m looking forward to learning more about their work and what it will really take to achieve basic quality education in Brazil. Next PostDid I offer peace today?